Our long travel through the beat cosmos "planet earth" leads us to Hungary. BluntOne & MUJO情 convince the listener with dreamish relaxing instrumental beats enriched by jazzy samples & hard banging drums! 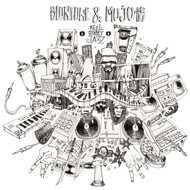 An major influence for Ninja MUJO情 is the sound of Japan, which influences his unique Lo-Fi sounds - in combination with BluntOne's very soulful vibes they complement each other in a perfect way! Bringt doch endlich mal einen Re-Release !